Baseballs hold a major fascination for Americans. I have created a hardwood ball that is true to the sport for your enjoyment. Each of these is made specifically for you and can be crafted to your exact request. My wooden baseballs are turned on a wood lathe from hardwood and have actual sewn stitches just as in a baseball. The stitches are proud of the wood so lend an authentic feel to the ball. The stitching alone takes several hours, thus the higher cost of these. 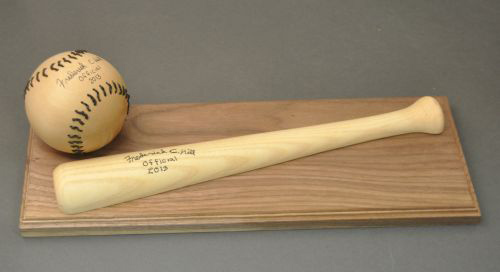 I present the baseball on a stand that is made of Black Walnut and that has a (half) bat on it. The plaque is approximately 15" X 6". This is a piece of art and, while the ball looks authentic, minor variations from the real thing occur. Each ball is unique! This work of art would grace the desk or wall of any aficionado of the sport. The wall plaque has a baseball and bat that are both permanently attached to the plaque. The back of the plaque has a hole that allows it to be hung on the wall from a nail or screw. Since this presentation is specifically a wall hanging, the ball cannot be removed. The tabletop plaque has the baseball resting in a depression in the wooden base but not permanently attached to the plaque. This presentation is meant for a desk where the baseball will be removed and handled. In both, the ball is hand signed and dated by me. In addition, as with everything I sell, the back of the plaque is also hand signed and dated by me. In addition, I will write any inscription needed on the bat. When you purchase one of these presentations, you need to let me know what you want inscribed on the bat. I use a permanent hand-held marker with archival ink for this process. © 2009 Fred's Creative Woodworking. All rights reserved.